Christmas time is always a time of the year where I have free time to do things that I would not usually be able to do during my week. One of my favourite things to do at Christmas is baking, not only do I love the baking process but I also love eating the finished project and seeing people’s faces when they eat what I have made. This Christmas I especially wanted to bake something as in France I don’t have an oven and so it is impossible for me to bake anything. 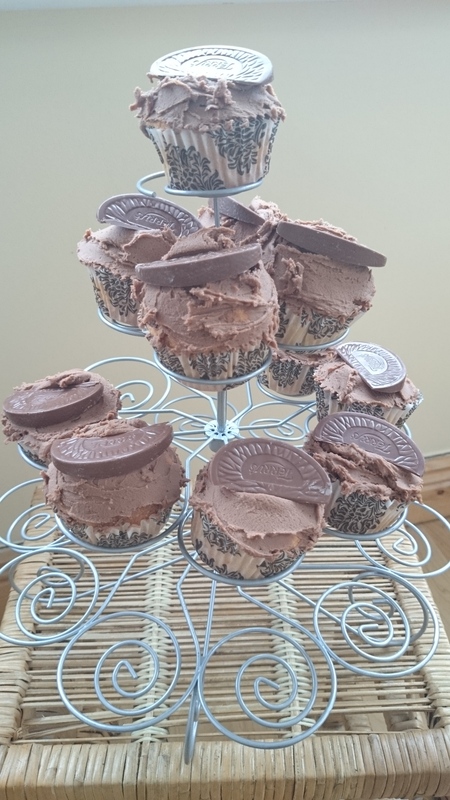 My favourite chocolate is Terry’s chocolate orange which you can get throughout the year but it is mainly popular at Christmas time so I decided to combine my two loves of cupcakes and Terry’s chocolate orange into one and made Terry’s Chocolate Orange Cupcakes. I brought some into the girls who I work with when I popped into to say hello and they went down very well. The main cupcake recipe is from The Hummingbird Bakery cookbook and it is just the vanilla cupcakes but I didn’t add any vanilla essence but you could if you wanted to. Then for the icing I just looked up a simple recipe on-line. Hope you like them and do let me know if you make them and how they turn out. 40g unsalted butter at room temp. 1.Preheat oven to 170°C, Gas 3. Line baking tray with paper cases. 2.Put the flour, sugar, baking powder, salt and butter into a bowl and mix until all ingredients are combined and it has a sandy consistency. Gradually add in half the milk and beat until the milk is combined. 3.Whisk the egg and the remaining milk together in a separate bowl and then add to the flour mixture and continue beating until all ingredients are combined and the mixture is smooth. 4. Spoon the mixture into paper cases until two-thirds full. Place a segment of Terry’s chocolate orange on top of each cupcake and push down slightly (this is just an option that I did to have a chocolate surprise when you bite into the cake). Place in the preheated oven for 20-25 minutes or until golden brown and the sponge bounces back when touched. When a skewer is inserted it should come out clean. 5.Take cupcakes out and leave on a wire tray to cool while you prepare the icing. 6. To make the icing place the chocolate into a bowl and melt slowly either over a saucepan of boiling water or in a microwave. When it is all melted leave to one side to cool slightly. In a separate bowl mix the butter, cocoa powder and icing sugar until all are combined. When chocolate has cooled add it to the butter and icing sugar mixture and mix until it is all combined. 7. 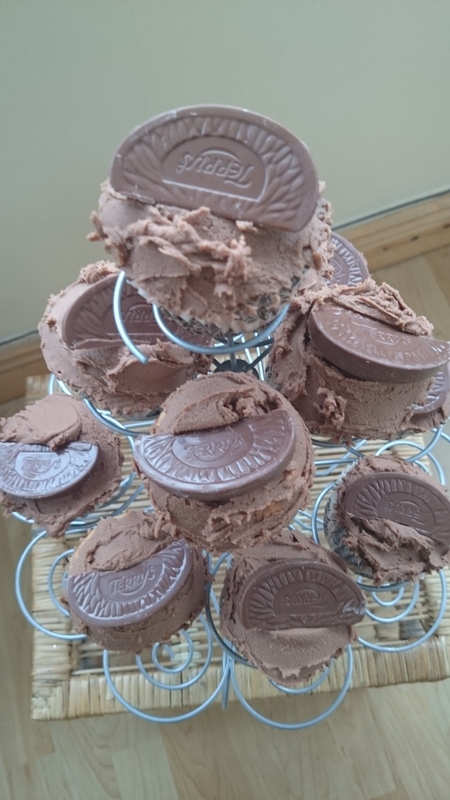 When cupcakes have cooled, ice each one generously and decorate with a segment of Terry’s Chocolate Orange on top.